For the first time in history, an Olympic torch will be taken into the vacuum of space during a spacewalk and you can watch it live online. Russian cosmonauts Sergey Ryazanskiy and Oleg Kotov will venture outside the International Space Station with the red and silver aluminum Olympic torch Saturday (Nov. 9), leaving from the station's Pirs docking compartment airlock at 9:30 a.m. EST (1430 GMT). Ryazanskiy and Kotov's expedition outside of the station is part of the Olympic torch relay that will eventually lead to the lighting of the Olympic flame in Sochi, Russia on February 7, 2014, kicking off the Winter Games. "I'm honestly looking forward to this, my first real life spacewalk," Ryazanskiy said during a news conference Friday. 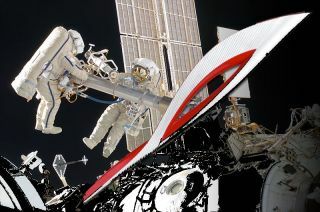 "We will perform usual EVA [spacewalk] with some special tasks … with the Olympic torch. This is part of [the] official Olympic torch relay that is now in our country." The torch will remain unlit during the duration of the spacewalk, but the two cosmonauts will pass it back and forth for a photo opportunity outside the station. In all, it will take about 20 minutes to complete the Olympic torch portion of the six-hour spacewalk. "We're going to move along the outside of the Russian segment and will be symbolically handing over the torch from one crewmember to another," Kotov said through a translator during a news conference Friday. "We will repeat that a couple or three times to make sure we have a pretty picture to show the whole world and our country will see the torch in a nice way with the background of the Earth and black space… It is sort of a creative task. It is technically challenging and we hope for success." Although this is the first time a torch has been taken on a spacewalk, it is not the first time an Olympic torch relay has gone to space. An Olympic torch flew on space shuttles in 1996 and 2000. Kotov has even thought about what he and Ryazanskiy might say when they make the historic spacewalk, but they haven't come up with anything solid quite yet. "If it is something important, it needs to be followed up with some kind of set of words," Kotov said. "We're not going to be too original." After finishing up with the Olympic torch, Kotov and Ryazanskiy will spend the better part of their six hour spacewalk performing maintenance on the orbiting outpost. The two cosmonauts will prep a platform for a camera system to be installed in December among other tasks, NASA officials said in a release. Ryazanskiy and Kotov aren't the first cosmonauts to carry an Olympic torch for the 2014 Winter Games. Valentina Tereshkova, the first woman ever to fly to space, completed a leg of the Olympic torch relay in Russia on Oct. 19. Tereshkova also took part in an Olympic torch relay for the 2008 Summer Games in Beijing. The torch came aboard the space station on Thursday when NASA astronaut Rick Mastracchio, Russian cosmonaut Mikhail Tyurin and Japanese astronaut Koichi Wakata docked their Russian Soyuz spacecraft with the station. This brings the number of people on the station up to nine — three more than the usual six that make up a full crew. The crowding will be short-lived, however. NASA astronaut Karen Nyberg, cosmonaut Fyodor Yurchikhin and European Space Agency astronaut Luca Parmitano will head back to Earth with the Olympic torch on Sunday.